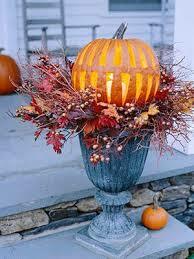 A stylized Jack-0-Lantern doesn’t have to be for just Halloween. A contemporary design like this can withstand the weeks prior and after Halloween, giving visitors to your new home a stylish welcome that beautifully celebrates the season. This low cost alternative can have you using an existing planter earn you’ve already got, and some leaves you’ve collected from your front or backyard. 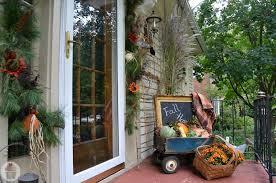 If you’ve already got a bench on your front porch, don’t pack it up for next spring just yet. 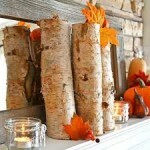 Using it to display seasonal cushions like these rustic birch fabric pillows creates a charming autumn glow to your new home. 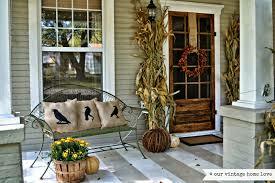 Accented by more rustic elements like a wood barrel flower pot filled with bright yellow mums, some scattered pumpkins and tall stalks of corn flanking your front door can be afforded if your new home features an oversized porch design. It’s all in the details with this one. A great vintage wagon like this creates a perfect vessel for some outdoor fall elements like hay, pumpkins and corn. The added touch lies in the framed blackboard, a great addition to customize welcome greetings for parties, Halloween or visits of any kind. So if you’re a lover of all things antique but using them indoors is questionable, why not feature these great pieces in your new home’s exterior fall decorating? 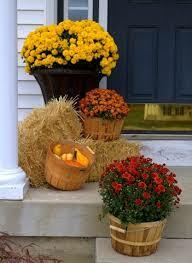 For a simple easy to achieve look in your exterior fall decorating, you really can’t go wrong with classic mums and some hay. 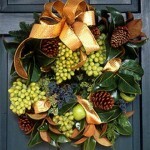 Clustering an overflowing grouping like this works great when your front porch isn’t that big. The quant and simple style might be as uncomplicated as the rest of your new home’s casual design. For more great decorating tips and design inspiration for your new home, be sure to visit the Mosaik Homes Facebook Page!